In my Advent quietness I have been thinking a fair bit about Mary, and particularly about how she was able to sing her song, the magnificat, which I say each evening as part of the daily office. The Magnificat became alive to me during my curacy at Rochester cathedral. To hear the same words sung every evening to a different musical setting allowed God to speak powerfully and differently. Daily repeated words took a different emphasis and conveyed a different meaning. I have been struck by Mary’s words of blessing … ‘From this day all generations will call me blessed’. Mary feels blessed. I have one question about that …. Why does Mary feel blessed? I ask because I have been mulling on her situation at the time of these words. A single girl. Not that well off. Engaged. Young. 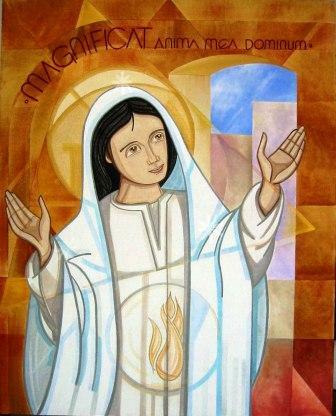 A virgin who has just been knocked up by the Holy Spirit. Life is not going to be easy for this girl, and she realises that. This is a bad time for this to happen to her! I guess I ask the question because I have become aware that I have fallen into the trap of misinformation where I have allowed myself to equate the word ‘blessing’ with a ‘gift’ or an ‘easy time’ or a ‘change in the situation’. Blessing and gift are two different things. Mary started this chapter poor, and she is still poor and we know she remains poor, yet she says she describes herself as blessed. As I have mulled these words over I have wondered if there is a little bit of Mary defiance in these words of hers. She knows her calling, her yes to God, is going to present her with a fair amount of crap in her immediate life …. and yet she defiantly looks ahead, trusts God, and her yes allows herself to see herself as being blessed. My ‘so what’ is that I have remembered that blessing from God is not dependant on how we feel or upon the immediate situation we find ourselves in. In other words, how we feel is not a real indication of whether we are blessed or not. The blessing is a fact! It is there, created within our DNA. The God imprint upon our lives. Rather than being some gift or situation change, I wonder if the blessing of God is more about choosing to see God at work, trusting that, and accepting that God is actually doing something, that God is actually working. I think recently I have lost sight of that …. and I believe Advent is the right season to remember that, sometimes, we need to take on a bit of Mary defiance and simply get on with life … because we are blessed. So …as the day draws nearer, may we defiantly remember and grasp and trust that blessing … Amen. This entry was posted in advent, faith by robryan65. Bookmark the permalink.